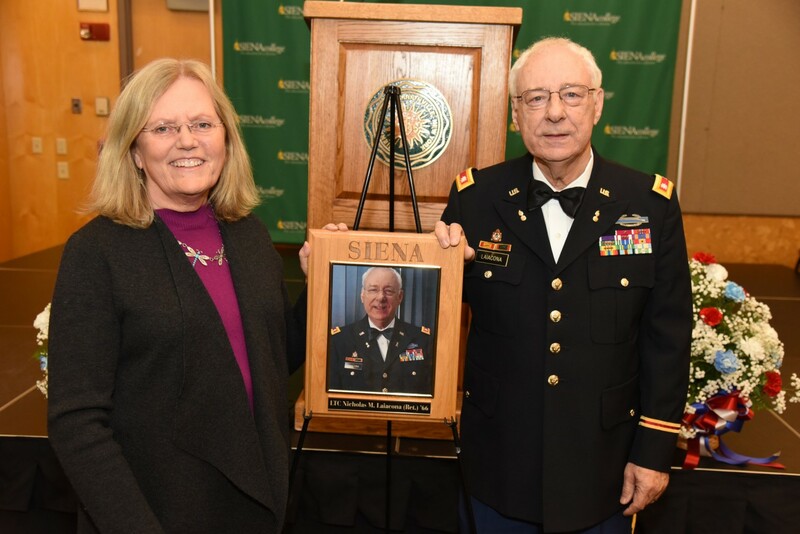 John W. Atkinson '86, audit partner at KPMG in Cincinnati, and a lead donor to the Siena Veteran and Cadet Fund, delivered the keynote address. 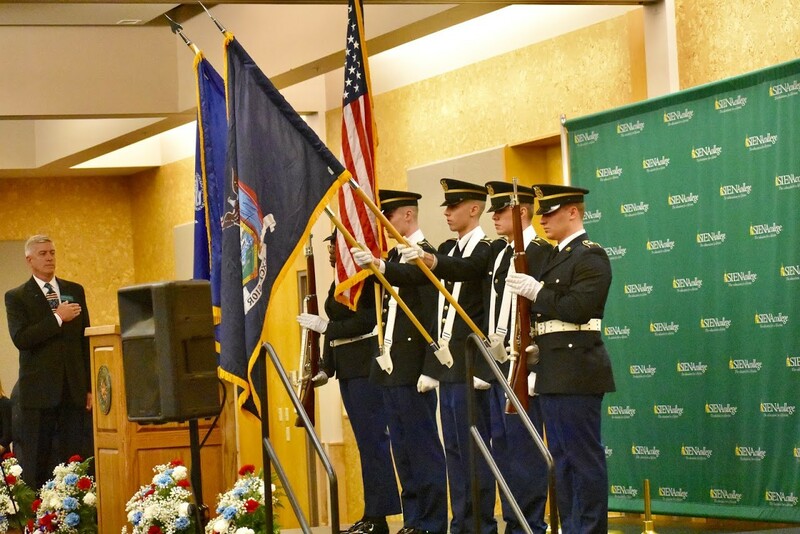 Atkinson joined ROTC after his freshman year at Siena so he could manage expenses and stay enrolled in the College he had grown to love. That decision marked a turning point in his life. 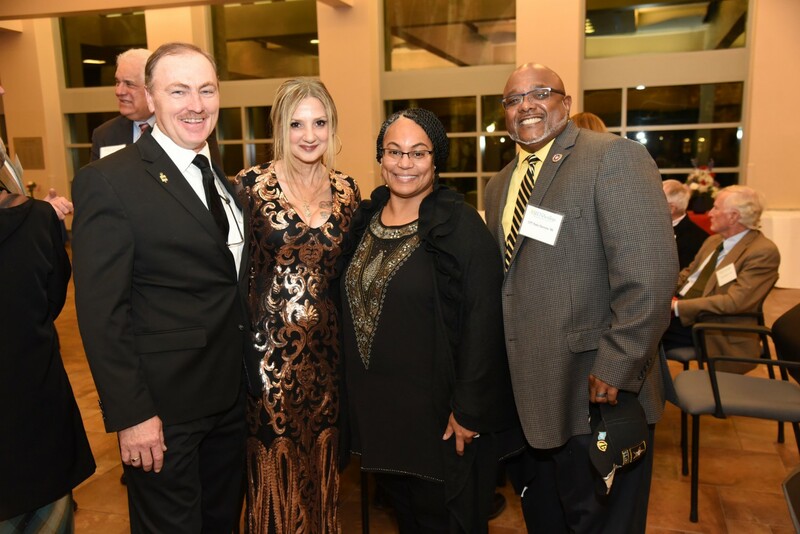 He was called to serve actively as a Captain in the Persian Gulf where he led a company of primarily African-American soldiers to battle in Operation Desert Shield and Operation Desert Storm. 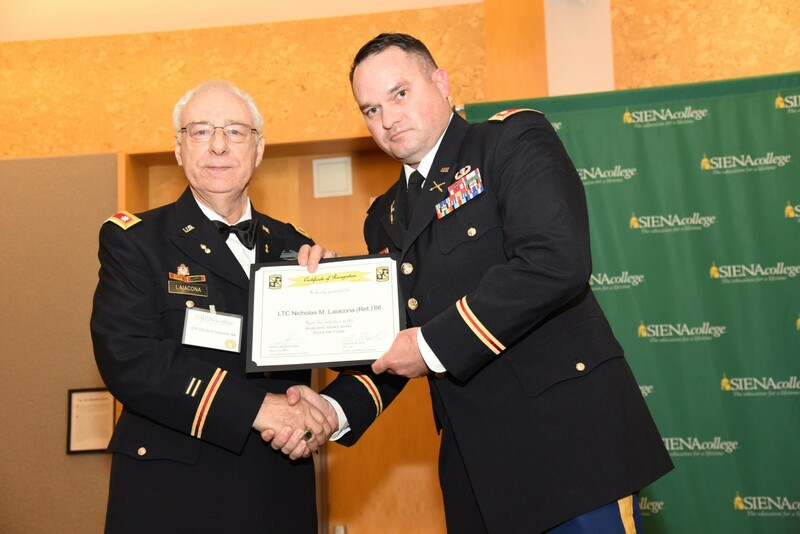 Atkinson attributed his success in the U.S. Army in part to his formative years at Siena, and he has carried the lessons learned in College and on the battlefield into his professional life. 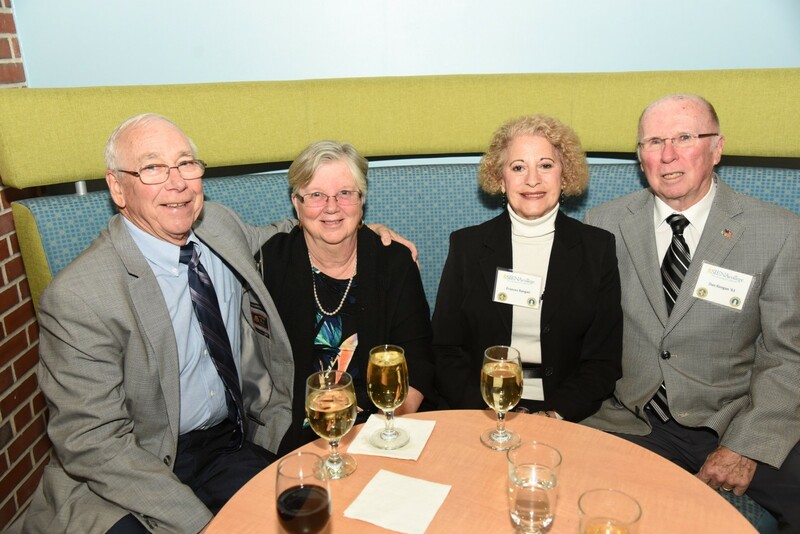 Atkinson currently serves as Chairman of the Board of Big Brothers Big Sisters of the Greater Cincinnati Chapter and on the Cincinnati Children’s Hospital Foundation Board. He’s a frequent speaker at National Association of Corporate Director’s Battlefield to Boardroom program which is designed to prepare and acclimate military flag and general staff officers to jobs in the corporate world. 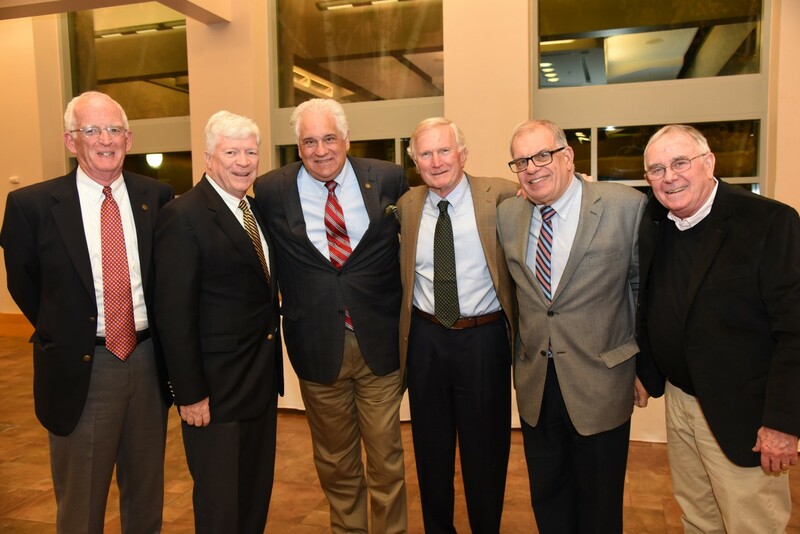 A highlight of the night was the induction of Lieutenant Colonel Nicholas Laiacona ’66 to the ROTC Mohawk Battalion Alumni Hall of Fame. Laiacona served as platoon leader for the 9th Infantry Division in Vietnam. He flew over 100 combat missions and led his unit through hostile fire and numerous traps in the jungles of Vietnam. Although many suffered injuries, including Laiacona, he never lost a man as platoon leader. Later in his tour, Laiacona was made C Company Commander after volunteering for three special operation on Viet Cong strongholds in the middle of the night. Laiacona was awarded four Bronze Stars for Valor, one Army Commendation for Valor, a Purple Heart, four Air Medals, and the Combat Infantry Badge. Gary Thompson '19 became the first two-time winner of the Veteran Award, earning the honor for the second straight year. 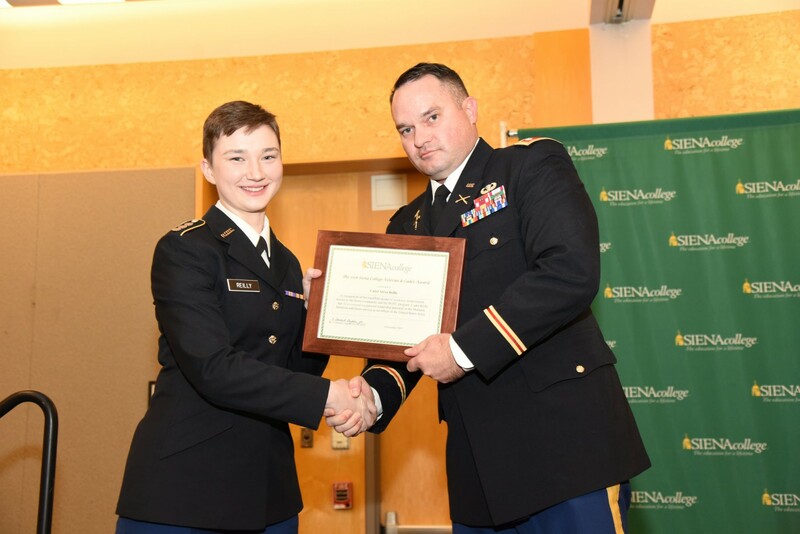 Alexa Reilly '19 received the 2018 Cadet Award, in recognition of her leadership of the Mohawk Battalion’s logistical operations – a position usually reserved for a Department of the Army civilian employee with many years of experience. 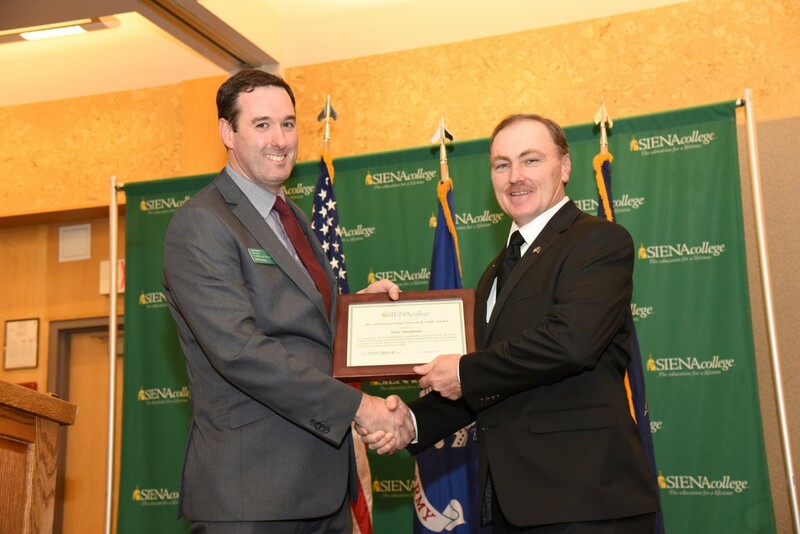 Lieutenant Colonel Andrew Beal, professor of military science, presented Reilly with her award noting the willingness and expertise she exhibited to address an urgent need. "Alexa saw that we were in trouble and just attacked the problem. What's most remarkable is that she's running our logistics operations better than before. She has an indefatigable work ethic, and an unstoppable drive for mission accomplishment. She is definitely punching above her weight; we are in her debt, and I am very much looking forward to commissioning her as a Second Lieutenant next summer."